Bajaj has launched the Pulsar 220F with a single-channel ABS. The new Pulsar 220F ABS commands a premium of Rs 7,600 over its non-ABS version. Over the years, the Bajaj has kept the Pulsar 220 F fresh by giving it timely updates and recent updates include a BSIV-compliant engine, a matte black exhaust end can, striking new graphics, a belly pan and rim tapes. Additionally, the side panels and the semi-digital instrument console backlit in blue now feature faux carbon fibre texture. In terms of mechanicals, the Pulsar 220 F employs a dual cradle frame paired with conventional telescopic forks and a twin gas-charged suspension setup at the rear. Braking duties are handled by a 260mm disc brake up front and a 230mm disc at the rear. Its 17-inch alloy wheels come shod with 90-section front and 120-section rear tubeless tyres. It now gets a single-channel ABS as standard. The Bajaj Pulsar 220 F is priced at Rs 1.05 lakh (ex-showroom, Pune) and goes up against its age-old rival, the Hero Karizma ZMR (Rs 1.1 lakh) and the Suzuki Gixxer SF Fi, which is priced at Rs 93,032 (all prices, ex-showroom Delhi). Bajaj Pulsar 220 F prices start at Rs. 98,685 (Ex-Showroom). Bajaj Pulsar 220 F is available in 2 variants and 5 colours. Share your experiences with Pulsar 220 F? The claimed ARAI mileage for the Bajaj Pulsar 220 F petrol is 40 kmpl. Despite being present in India for over a decade, the Bajaj Pulsar 220F still remains popular among enthusiast motorcyclists including those who are into stunts, the Pulsar 220F is an easy to ride, fast motorcycle and good value. Q. Pulsar 150 or Pulsar 220F which is better for daily use? Q. Is there any major problem in this Pulsar 220 F? Q. Pulsar 220 F ki 2nd Service kab karvade? Q. Is it worth for daily commute? Q. How is the pick up? The Bajaj Pulsar 220F has been updated to meet BS-IV emission norm and has also gotten a few cosmetic updates for 2017. So how different is it to ride? It is fast, affordable and good value. But, dynamically, it clearly feels a generation old. The Bajaj Pulsar 220F was a revolutionary motorcycle when it made its debut over a decade ago. Among the main reasons for its success was its stylish looks with the quarter-fairing giving it a sporty stance. And we have to admit that the Pulsar 220 has aged well and can still hold its own, even in the company of modern rivals. Talking about features, the Pulsar 220F gets a semi-digital console, backlit switches, projector headlamps and LED tail lamp (most of which were segment-first features at the time of its launch). The engine is now compliant with BS-IV emission norms and the 220cc, single-cylinder, DTS-i motor delivers 21PS and 19Nm of peak torque and is mated to a 5-speed gearbox. The Pulsar motor isn’t the most refined unit in the segment but it does offer peppy performance. Braking is done by disc brake units on both the ends while ABS hasn’t been offered even as an optional extra. Suspension duties are handled by telescopic front forks and gas charged twin shock absorbers at the rear. The Pulsar 220 tips the scale at 150kg and has a 15-litre fuel tank. Suzuki Gixxer SF: Although the Suzuki Gixxer SF can’t match the outright power of the Pulsar 220F, it outdoes the Pulsar in terms of handling dynamics and engine refinement. Also the Gixxer SF is easier to ride in city and is well damped too, but has been priced at a premium. 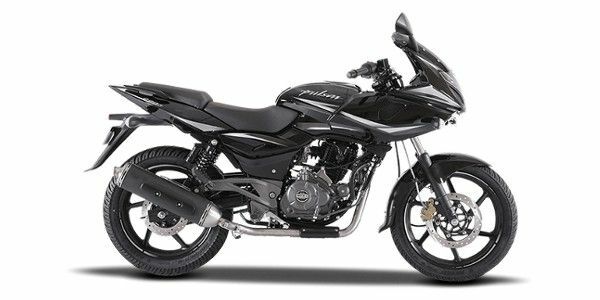 Confused about Bajaj Pulsar 220 F?